Dosa, a kind of Pancake which is the very popular South Indian breakfast served with coconut chutney, Sambar. There are many varieties in Dosa from plain dosas to crispy masala dosas that are a foodies delight. A versatile dish which can be eaten for breakfast, lunch and dinner. 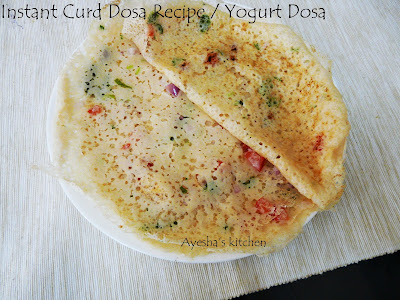 Here am with Curd dosa recipe with Rice flour. An Instant dosa which can be prepared within minutes. Curd dosa is also known as Yogurt dosa, Perugu dosa, Dahi dosa, Thairu dosa, Puli dosa and so on. Here I used roasted rice flour ( Puttupodi) which is homemade. This roasted rice flour is used for making steam cake ( puttu) and my kids fed up eating this steam cake every morning. They love to have dosa. But never eat the same kind all the time. This leads to making curd dosa with roasted rice flour and it came out very very well. 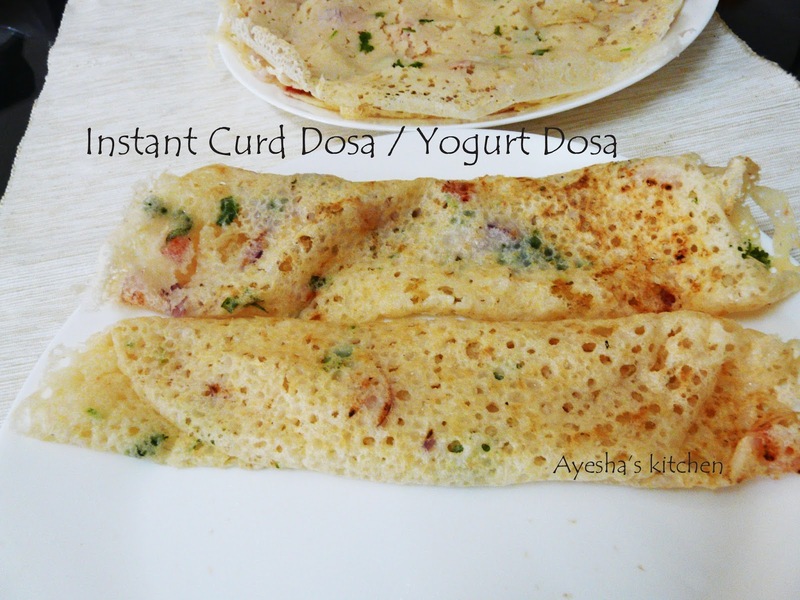 Feel very happy to share this soft yummy instant dosa recipe. Do try and make your kids happy!! Roasted rice flour - 1 cup ( as it is roasted, 1 cup is enough to make more dosa. Roasted rice powder can be bought from supermarkets. Roasted rice flour and steam cake flour ( puttu podi) are same. Grind together roasted rice flour (puttu podi) and curd with more than half a cup of water. Grind until a smooth paste. As it is roasted, you might need more water for grinding. So use accordingly. When done transfer it to bowl. The consistency must be like rice dosa batter( ari dosa batter). Should not be too thick nor too thin. Must be of a flowing consistency. Add salt and now add the chopped onion, tomato, coriander leaves and combine very well. Add oil to the flour mixture. So that you do not need to grease the frying pan before making each dosa. Now heat a pan and grease it well with oil( only for the first dosa). When it is hot (do not prepare in high flame or very low flame, always prepare dosa in a medium flame) take a ladle full of batter from the outer side to the inner portion. If the gaps are too big, fill them with batter. Drizzle some oil/butter on the top ( optional only) after 30 seconds. Close it with a lid. Flip after few seconds and again cook for few seconds. Same like Rawa dosa only. When done, transfer it to a plate and serve immediately. It is very delicious when served immediately.